The Disabled Club is a group in which none of its members want membership. I unwillingly joined in 1997 when my daughter suffered a massive brain injury at birth and developed cerebral palsy. For the last 18 years of membership, my dues have included pushing a wheelchair, diapering a teenager and enduring almost two decades of Barney. Our lives take a 180-degree turn when we must take care of a loved with this disorder or any other debilitating condition, including mesothelioma. Suddenly you and your immediate family are plunged into the world of those diagnosed with a disability. You are no longer “normal” to most of society. You have a problem — a big one. It seems as if your life has come to a screeching halt while everyone else, excuse the cliché, seems to be going on their merry way. When my tragedy hit, I felt like I was living in another dimension. I was suddenly immersed into an endless run of hospitals, doctors and diagnoses all couched in emotion and fear. The day-to-day of what’s for dinner, what’s on television or what is the latest gossip seemed as far away as Mars. My daughter’s condition meant a lifetime commitment for me. I wasn’t getting out of this club. When the word is out that you or a loved one has mesothelioma, people fall into a couple different categories. I’ve learned in my almost 20-year experience with a disability that people really do mean well. Mostly they are just ignorant about dealing with a disability, much like I used to be. People really don’t know what to say when they see you or your loved one for the first time after they hear the news. At first, you get plenty of special treatment. But soon enough people return to their own lives. In the meantime, your life is anything but normal. You feel very alone. Your new pastime is sitting in a doctor’s office waiting room. Your nights are filled with anxiety over what the future looks like. You hear about others’ problems like their car broke down or their furnace went out, and you wish your car was on the blink or your house was frigid, instead of your lungs failing more each day. You also don’t hear from people you thought would always be there for you. Social situations also hike up the anxiety. Gone are the days of discreetly walking into a gathering. For me, I’m the one pushing a wheelchair that usually has to be lifted by a couple strong men because most homes don’t have ramps. I’m also checking the wheels, making sure dirt isn’t getting tracked into the house. It’s a big hubbub, and everyone stops to look or swarm around to help. Then it all starts again when I have to take my daughter to the bathroom. People with mesothelioma and their caregivers face similar scenarios. 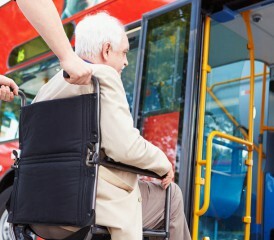 Those with the condition may be slower, unsteady or using a walker or wheelchair. When you enter a gathering, you’re noticed. What you really want is to come in and join the party like everyone else, not make a big stir and feel like you’re a big inconvenience. For some with mesothelioma, there are times when the first thing that hits you in the morning is that you have a terminal disease. I call it the brick on the chest. I’ve had that brick on my chest since my daughter was born. It’s a heaviness that never goes away. You can’t do things you used to do. You don’t have the stamina or the strength. Life as you knew it is slipping away. I confess that I’ve felt a kind of imprisonment since I had my daughter. My life is like a wheel. She is the center and the spokes are the things I want to do or have to do, and everything revolves around her. Our lives as caregivers are different from others. We can share our thoughts with a trusted few, but we can’t talk about it endlessly with everyone. They will simply get tired of listening, so we must often endure quietly and go on as if everything is normal. I’m always comforted when someone else is experiencing what I’m experiencing. It makes me feel less alone and even provides an opportunity to laugh about shared frustrations or commonly experienced situations. We must extend a lot of grace when awkward or insensitive comments are made. Don’t feel like you have to attend every social gathering if you’re not up to it. Life is different, and it’s okay to say no. If you want to attend a gathering, arrive early and get situated before everyone is there to avoid an awkward attention-getting entrance. Initiate social interactions with trusted friends or family in a place you can control like your own home or a nearby restaurant. Accept your ‘new normal.’ Be thankful for the years of health and strength you had and make the best of your new situation, finding things you still can enjoy. Rejoice that this trial gives you and your family a time to focus on the more important things in life like relationships or spiritual growth. Let the experience make you a more loving, kind, gentle and better person with a greater heart toward those with disabilities or with struggles in their lives. I’m a different person than I was 18 years ago. Living with a loved one with a disability has made me more compassionate, kind, patient and thankful. I won’t say that I’m glad my daughter had a brain injury, but I am truly thankful for the fruit that resulted in my life because of it. Membership in the Disabled Club does set us apart and yes, in a lot of ways, it really stinks. But difficulty can center us on what’s important, too. It didn’t come right away, but in my journey, I’m learning to choose grace and thankfulness.